But rather than giving up, tuning out, and complaining that politics are broken, Levesque decided to take matters into her own hands and run for office herself. On Nov. 6, 2018, she won her election to the New Hampshire House of Representatives. She wasn’t even old enough to legally commemorate her victory with a celebratory drink. There are examples of this everywhere across our country. Young people understand that we have a responsibility to better the world we will be stewarding by becoming involved in politics. Just consider the facts: The congressional candidates who won in 2018 will form not only one of the most diverse Congresses in history, but also a much younger Congress. With the midterm results all but wrapped up, the average age of a member of Congress will drop by 10 years in 2019. And most recently, calls for a Green New Deal, a set of legislative proposals that seek to simultaneously provide millions of jobs and transition our nation away from fossil fuels, have sprung up among the progressive lawmakers-to-be who were elected this past month. But the movement isn’t being led just by those representatives-elect. 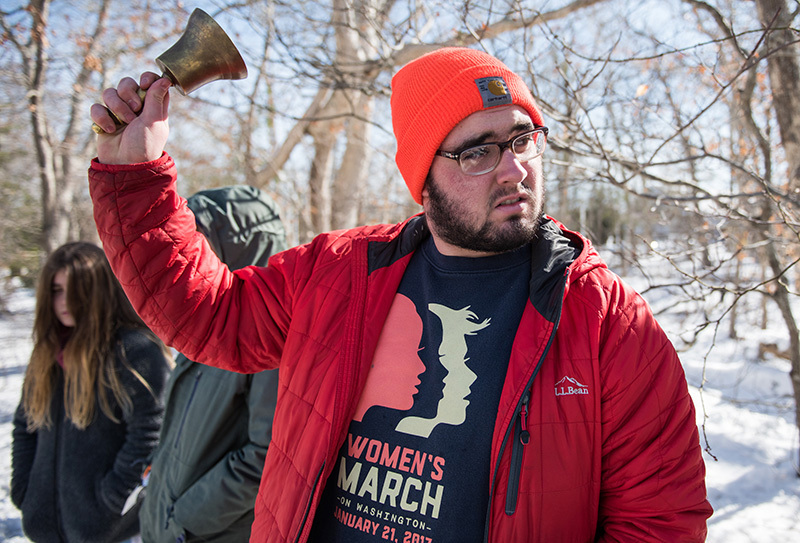 This youth political activism has been seen right here on Martha’s Vineyard, as well. Take the dozens of students who attended the March for Our Lives last March in Washington, D.C., to protest against gun violence, and the Vineyard community that came together to send them. Take the unprecedented number of high schoolers who preregistered to vote through the League of Women Voters of M.V. Or take my election to the Dukes County Commission at 18 years old. Finally, back to the earlier statement about taking responsibility for the world that we will be inheriting. I firmly believe that this is the primary catalyst for the youth energy we saw these past two years and this election cycle. The America and the world that we are in the long process of being granted needs some serious work, to put it mildly. After 2016, it was as clear as ever that if young people didn’t start to care about the world we were being handed, it might be too late to save it when we did finally begin to care. For some, the work is to solve the climate crisis, a problem so vast that it was punctuated by a recent U.N. report that grimly concluded that we have just 12 years to hold global warming to below 1.5° Celsius and avoid irreversible catastrophe. For others, that work is to combat economic inequality, as our nation deals with the worst levels of it in nearly a century. For still others, it is to educate the world about the pervasive and extremely harmful role that sexism, racism, xenophobia, homophobia, and anti-Semitism had and still very much have in our society. For most of us, it’s a combination of all of these topics. Young people were and are on the front lines because we know that it is time for us to be the leaders. The world that is being changed by policies being implemented today is ours to grapple with tomorrow. We will not forget the elder statesmen who have previously led the way, but at some point, the baton must be passed, and we are as eager as ever to take it. We are looking forward to rolling up our sleeves, getting to work, making mistakes along the way and learning from them, and ultimately coming together to create a better world. Keith Chatinover is a recent graduate of Martha’s Vineyard Public Charter School. He is headed off to Middlebury College in January, but has vowed to participate remotely as a Dukes County commissioner. Previous articleWhere is Martha heading? Next articleAsking the looking glass of a single Island house: What is our economic future?